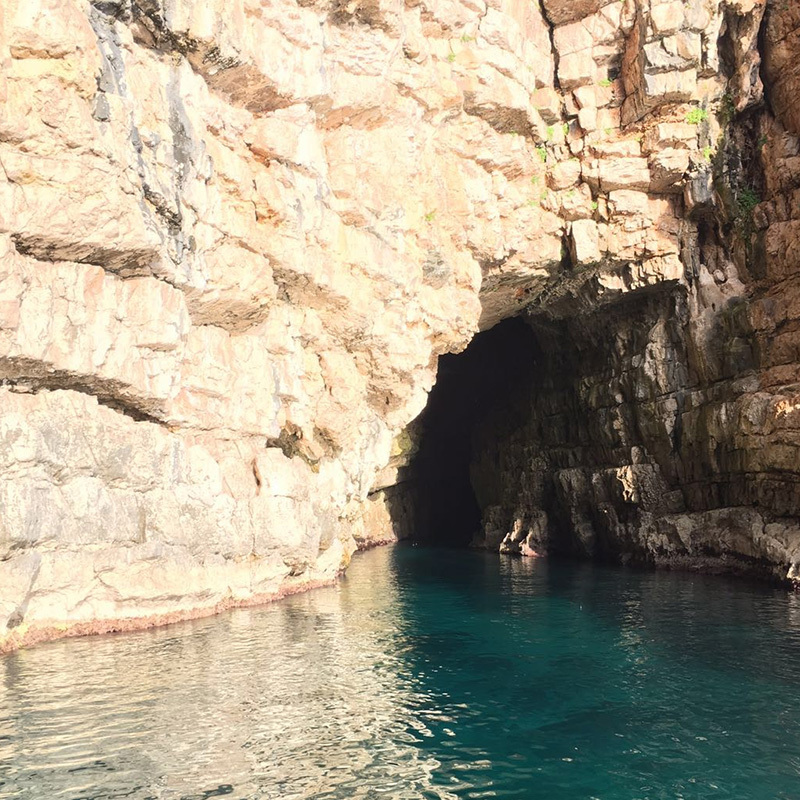 Blue Grotto, one of the few natural gems of the Mediterranean, is perhaps the most beautiful natural phenomenon in the 6 Bays of Boka. This beauty is one of the largest in a series of caves on the peninsula of Lustica. It has two openings – small one on the south and a bigger one on the southwest side. Boats approach through the smaller entrance and unveil an incredible game of sea and lights that will leave you breathless. The sunlight enters the cave through the small opening and, as it reflects of the water, it colors the water and cave walls in gorgeous bright shades of blue. In addition, resonance of the cave turns every sound within it into an echo, which is yet another of the phenomena characteristic of this hidden treasure. Go swimming or snorkeling to see the array of colors and treasures beneath. Hardly to be seen anywhere else in the world, this natural theater entices you to swim in its warm water. Dive into indescribable blue waters of this enchanting castle! The tour to the caves takes 3 hours. This tour can be extended into a half day (4h) or full day (8h) tour with a lunch stop and exploring other sites within the area. The tour begins from Tivat – Porto Montenegro – Pier 1. However we are happy to collect you anywhere on the Kotor Bay (extra charges may apply depending on time and distance). Hear about the history of the Submarine Tunnels, Mamula and Blue Caves; stop for swimming & snorkelling in the Blue Caves. Swimwear if you would like to swim or snorkel. Full meals can also be catered on board the boat. You might want to bring a light jacket, as the weather gets cooler as the sun sets. Depending on the weather we may not be able to visit the caves when the tide is high, or swell (big waves). If weather does not permit, the tour itinerary maybe altered to visiting The Fishing Village or Herceg Novi old town. If you choose to extend the tour and visit Mamula Fortress island, as it remains in a raw state, if you have problems getting on and off the boat, we do not recommend getting off onto the island. Depending on the weather we may not be able to stop off near Mamula Island, if the weather or tides do not permit. Boating is an active entertainment and there is always a chance you may get wet. We are happy to provide waterproof ponchos if needed. Tourist boats tend to visit the caves during the hours of 12 - 3pm. We recommended visiting before or after and taking a lunch break. Tour price depends on number of people and which boat you book. For more info and a quotation please contact us via email or info line. Included: 2 bottles of local wine or Prosecco, glasses, a traditional cheese and ham plate and/or fruit plate for every two persons and towels upon request. Snorkle sets are provided free of charge of the Blue Cave Tour. Not Included: Additional choice of champagne, beer and wine. A full list of champagne, wine or other catering options are available upon request. If you wish to extend the tour to lunch, it is not included in the price of the tour. Lunch packages are available at selected restaurants upon request. Skipper Extra waiting time: 35€ per hour. Notes: All our tour guides are Local Licensed Guides specialising in the region of Boka Bay and the country of Montenegro.